and the Iranian Resistance’s call for a movement to obtain justice for the victims and prosecute the murderers who are still in power in Iran. Every year, mothers and relatives of the massacred political prisoners hold ceremonies commemorating their loved ones who were victims of the worst crime against humanity since World War II. This year however, the execution of Sunni prisoners was a grim reminder that these crimes are continuing unabated. Mothers and human rights activists from all across the country and the world sent messages of sympathy and solidarity to the bereaved mothers and wives of the executed prisoners, or visited them, sharing their experiences and pledging to join hands in continuing their efforts to obtain justice for their loved ones. In another act of protest from inside prisons, human rights activist and advocate of abolition of the death sentence, Narges Mohammadi sent out an open letter, describing solitary confinement as “white torture” and “inhuman” for thousands of civil and political activists who are arrested and detained every day. A woman was hanged in the Central Prison of Yazd (central Iran) in the morning of Thursday, August 25, 2016. The number of women executed under Rouhani thus reaches 70. The State Security forces of Terjan district, in the Iranian Kurdistan, shot directly at a Toyota on Thursday, August 11, 2016, and killed a civilian woman. The victim, Jaleh Ghaderzadeh, 36, was taking food along with her husband, for the people working on a wheat farm nearby when the SSF suspected their car and opened fire on them. Political prisoner Afsaneh Bayazidi is under torture by agents of the Intelligence Department to make forced confessions. Afsaneh Bayazidi, student from Boukan, was arrested at her residence on April 24, 2016. She is accused of collaborating with Kurdish parties. Security agents attacked the residence of Ms. Gohar Eshghi, in the afternoon of Friday, August 26, 2016, beating up and arresting Sahar Beheshti and her husband. They blocked the roads to Ms. Eshghi’s residence and prevented people from attending the birthday celebration for the slain web blogger Sattar Beheshti. Starting in the morning, the Intelligence Ministry phoned those intending to attend the ceremony and threatened them with arrests. Ms. Beheshti was released the next day on a bail bond. Sattar Beheshti, 35, was a worker and a web blogger who wrote articles critical of the government. He was arrested at home on October 30, 2012, and killed under torture after only four days. No information is available on two young Kurdish women, Sahar Feizi and Manijeh Fatehi, arrested by Kurdistan’s Department of Intelligence. Sahar Feizi, a 24-year-old college student from the city of Saqqez, was arrested on Wednesday, July 13, 2016, for participating in the general strike of the people of Kurdistan. Manijeh Fatehi, 22, from Boukan, was arrested during a raid on her residence on March 5, 2016. The reason for her detention is unclear. August 8, 2016: Security agents raided to a private party in the northwestern city of Soufian in East Azerbaijan Province and arrested 20 girls and boys. August 16, 2016: The paramilitary Bassij force raided a private party held at a park, in Sorkheh Hessar, east of Tehran. More than 60 young men and women were arrested. August 19, 2016: State Security forces raided private parties in Shiraz and arrested 63 girls and boys. August 19, 2016: In the northern city of Amol, SSF troops raided a private party and arrested 20 university students, both girls and boys. August 25, 2016: 40 young women and men were arrested in a private party in Gorgan. August 27, 2016: 20 young women and men were arrested in a private party in northwest Tehran. August 30, 2016: State Security forces raided a private party in Kerman (southern Iran) and arrested 34 women and men. 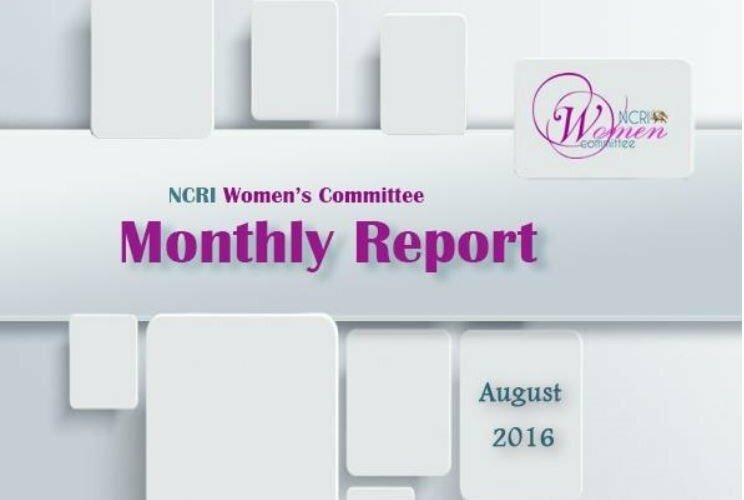 The report added that women’s rights activists in Tehran have been summoned for long, intensive interrogations by the Revolutionary Guards, and threatened with imprisonment on national security charges. In an open letter on August 24, 2016, human rights activist and advocate of abolition of the death sentence, Narges Mohammadi, described solitary confinement as “inhuman” and as “one of the most ruthless mental and psychological tortures” routinely practiced in the Iranian jails against prisoners of conscience and political prisoners. She described solitary confinement as “white torture” which has become “common practice” in Iran. Thousands of civil and political activists have been confined in solitary cells over the past 37 years, without any security or legal justification, Nargess Mohammadi asserted. Two prisoners were reported in August to be in particularly dire health conditions. Kurdish political prisoner Zeinab Jalalian is almost blind in both eyes due to brutal tortures. Zeinab Jalalian has endured vicious tortures under interrogation. Interrogators have repeatedly hit her head against the wall, fracturing her skull and causing brain hemorrhage and vision impairment. She is denied access to essential medical care. Prison authorities have conditioned Ms. Jalalian’s access to medical care on her making confessions. Political prisoner Qadrieh Qaderi is deprived of medical leave despite numerous physical illnesses in need of treatment. This is the fifth year she is imprisoned in Yasouj Prison. Based on reports from prison, she suffers from ear infection, severe headaches and numbness of one of her hands. In the month of August, universities were instructed to report on their measures to safeguard “Protection of veiling and virtue.” Tehran’s Prosecutor asserted the need for stepping up violence against women. And the SSF forces continued to launch raids on businesses, sealing them up. The Interior Minister also announced that all the measures related to women’s Hijab are directly reported to Hassan Rouhani, the mullahs’ President. The Interior Minister, Rahmani Fazli, stressed that compulsory veiling is “a governmental duty” which cannot be put off. He reiterated that all measures undertaken for social control are reported directly to Rouhani, the mullahs’ president, Hassan Rouhani. There were a considerable number of reports in August on suicide by teenage girls, indicating the amount of pressure and abuses they experience in family and society which make life intolerable for them. A 12-year-old girl from Kamyaran, Iranian Kurdistan, took her own life on Saturday, July 30, 2016, under pressure from her family to get married. Mahasti Assadi was under pressure from her grandmother to get married with a 25-year-old man who is mentally and physically disabled. She used her grandmother’s veil to hang herself from gas pipes. She passed away on the morning of Monday, August 1, in a hospital in Sanandaj. A young woman in the southern city of Dezful committed suicide by setting herself on fire. Two teenage girls (13 and 14 years old) threw themselves down a building and lost their lives. The tragic incident happened in the morning of Saturday, August 13, 2016, in Tehran’s Jannat Abad district. A 17-year-old girl identified only as P.M. committed suicide on Monday, August 29, 2016. The young woman residing in Yassouj, southwestern Iran, killed herself by taking pills. Nazanin Bangaleh and her father, Nematollah Bangaleh, were arrested on August 27, 2016, in Shiraz (southern Iran). The Bahaii family’s home was raided by security forces and their computers, mobiles, books and notes were confiscated. Most of the protest activities in August revolved around the massacre of political prisoners in summer 1988 and the mass executions of some 25 Sunni political prisoners from Kurdistan. Teachers demanding official employment and insurance also held a sit-in protest and picket opposite the parliament for over two weeks, while others protested newly imposed ban on women’s bicycling. Bereaved mothers from across Iran and the world, political prisoners, and civil activists wrote letters to the mothers and families of the 25 Sunni prisoners executed on August 2, 2016, at Gohardasht Prison and expressed their sympathy and solidarity with them. They urged the former to keep their head up and be proud of their children for standing up to the oppressive regime. Mothers against the death penalty also travelled from Tehran to Saqqez and Sanandaj to condole the prisoners’ mothers and families. They also met with families of Farzad Kamangar, Kianoush Asa, and Sanee Jaleh in Kermanshah (western Iran), victims of executions and crackdown on 2009 demonstrations in Iran. About their meeting with the mother of Kianoush Asa, Ms. Pakravan wrote: She tapped her chest and said: Farzad is alive in the hearts of millions of Iranians! Ms. Shahnaz Karimbeigi said: Each of the beloved children of this land pave a road towards freedom and prosperity! Mothers and families of political prisoners and victims executed or killed during the 2009 uprising gathered in Khavaran cemetery in the afternoon of Friday, August 26, 2016, and held a ceremony on the 28th anniversary of the massacre of political prisoners in summer 1988. Security forces had surrounded the cemetery and controlled all the movements to and from Khavaran throughout the ceremony. Shahin Mahinfar, an anti-death-penalty activist who lost her son in the 2009 Iranian uprising when SSF cars ran over protesters, wrote on behalf of all activist mothers. Hundreds of teachers of the literacy movement continued their protest on August 15, 2016, for the second consecutive day outside the Iranian regime’s parliament. Their main demand was to be officially employed by the Education Ministry. On Wednesday, August 17, 2016, they focused their demands on the reform of the employment law. These women demand that the government work out and define their employment and insurance conditions which has caused tremendous problems for them over the years. The protest gathering of literacy teachers and assistant teachers was staged for the 14th consecutive day on August 27, 2016, in front of the Majlis (the mullahs’ parliament). In a march with bicycles on Tuesday, August 2, 2016, the people of Marivan (Iranian Kurdistan) carried placards protesting the State Security Force’s ban on women’s bicycling and declaring it unlawful.